Along with increasing iPhone camera capabilities, storage solutions are becoming increasingly important for taking and keeping better quality photos. But is it your iPhone that needs all that storage? With iKlips DUO it's not about keeping everything on the go. It's about managing your device better with the content you need when you need it. Now can easily and securely share your music, photos, videos, work projects, and all your other creations between all your devices - iPhone, iPad, iPad Pro, Mac, and PC. Having the ability to organize, store more and share on the go with friends, family, and colleagues gives you the power to do more on the go. Unique key ring design to attach to your personal items. 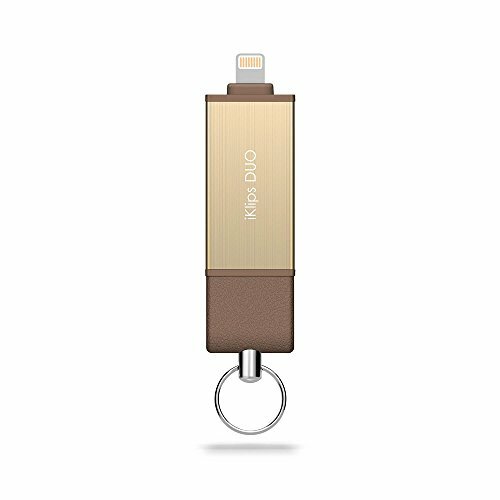 New lightning connector body design to fit even more iPhone cases. Enhanced rubber body sleeve to provide greater protection and cover. View photos, documents, playback music, TV series and movies, backup and manage files directly from iKlips Duo. Upgrade your device storage up to 256 GB (32GB/64GB/128GB/256GB capacities). Ultra slim aluminum material design - the same aluminum grade as iPhone 6. No built-in battery - no need to charge iKlips DUO. Support exFAT format, which allows you to transfer the single file sized more than 4GB!! If you have any questions about this product by Adam Elements, contact us by completing and submitting the form below. If you are looking for a specif part number, please include it with your message.